Today's Giveaway is for everyone! I just wanted to take a few minutes to share something with you all, since I won't have the time to finish all 12 of my stamp set giveaways. 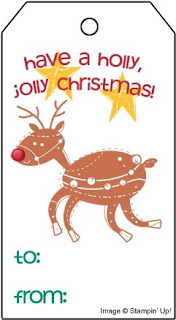 Click HERE to download PDF sheet of Cookie Tags. I thought I'd share these tags with you, in case you are also looking for some festive tags in a crunch. The only cutting directions I can give you is that I centered the tags on the sheet, so you can start by cutting your paper or card stock down the middle lengthwise. Each tag is about 2" wide, and about 3-1/4" tall, though that's not exact. I was sleepy and in a hurry, so I cranked these out super fast! (Be sure to set the Page Scaling to None when you print these out, so you don't change the size.) After printing, I cut them all out, then punched a hole in the entire stack of 12 tags at the top center with the Crop-A-Dile for ribbon to go through, then punched off the top corners with the Tag Corner Punch. I'm so very grateful to have My Digital Studio, to do the crafting for me when I don't have the time to do it all by hand! 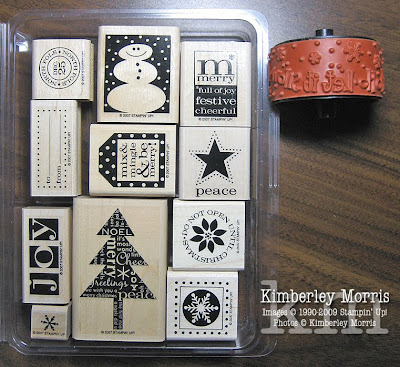 I don't even own the actual physical stamp set (A Holly, Jolly Christmas) that I used to make the tags, so having that art available to me was an extra bonus. NOTE: My Digital Studio is for personal use only, and all images are copyrighted. These tags are for personal use only, not commercial use--so please don't use them on, or in conjunction with, a product you are selling. Unfortunately, we're having a family emergency right now and I'm unable to continue with my Giveaways. I'm so sorry, I really wanted to keep going, but I've tried and I just can't keep up with it, and that's not fair to you. So, I will be working today to get the remaining packages for previous winners sent out, so you can be sure to get them before Christmas--they are going Priority Mail. I would appreciate any prayers and good thoughts you're interested in sending our way, for luck, justice and protection. Thank you so much for visiting my blog, and please hang in there with me for the next few weeks while I attend to my family's urgent needs. Today is DAY EIGHT of my Twelve Days of Blog Candy Giveaways. Leave a comment with your first and last name, and email address, to enter. Make sure you check out the Rules in THIS POST before leaving your comment, to ensure your entry qualifies. 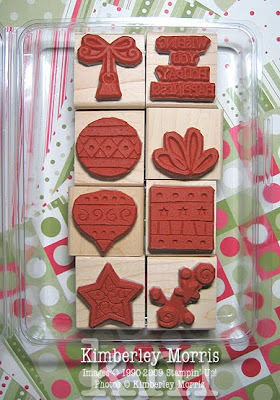 Today's Giveaway includes the Perfect Presentation stamp set, and the Stampin' Around Ho Ho Ho wheel. The wheel says, "Ho Ho Ho Let it Snow" and has some snowflakes on it, which coordinate with the tiny snowflake stamp in the stamp set. The photo below shows the rubber on the back of the stamps. They are a lavendar color because this was only available as a Hostess Set. To use the Stampin' Around wheel, you'll need a Stampin' Around Handle (102971, $3.95). The stamp set works great with a number of our punches: Star Punch (109045, $10.95), Small Tag Punch (108264, $15.95), Tag Punch (105934, $15.95), 1/2" Circle Punch (104390, $5.95), 3/4" Circle Punch (107217, $10.95), 1" Circle Punch (109046, $10.95), 1-1/4" Circle Punch (104403, $15.95), and 1-1/4" Square Punch (104400, $15.95). You can order any of the above supplies through my ONLINE STORE anytime! UPDATE: This Giveaway is closed, please come back after 8am MST on 12/15/09 to see Day Nine's Giveaway! Today is DAY SEVEN of my Twelve Days of Blog Candy Giveaways. Leave a comment with your first and last name, and email address, to enter. Make sure you check out the Rules in THIS POST before leaving your comment, to ensure your entry qualifies. Today's Giveaway includes some Star Bright paper ornaments (die cut and scored patterned paper + elastic cord), some On Board Trinkets ornaments (die cut chipboard + die cut patterned paper), the Miracle of Christmas stamp set, and the Stampin' Around So Swirly jumbo wheel. The stamp set is from 1998, and the wheel is very recently retired, but I think the bold lines of the wheel match the stamp set images perfectly! And the wheel is not seasonal, so you can use it throughout the year. 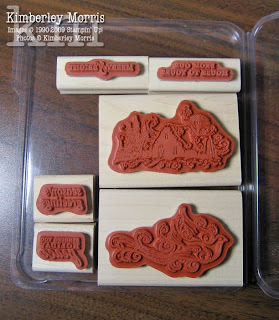 The photo below shows the rubber on the back of the stamps. To use the Stampin' Around wheel, you'll need a Jumbo Stampin' Around Handle (103661, $5.95). To adhere the patterned paper to the chipboard ornaments, the Tombow Multipurpose Adhesive (110775, $3.95) works wonderfully, or you may prefer the Anywhere Glue Stick (104045, $3.95 for pkg of 2), or the 2-Way Glue Pen (100425, $3.50). Be sure you enter this giveaway in accordance with the RULES, or your entry will be discarded. You must enter by 6am MST on 12/14/2009, to be in the drawing for the Day Seven Giveaway! Day Eight's Giveaway should be posted, along with Day Seven's winner, by 8am MST on 12/14/2009. UPDATE: This Giveaway is closed, look for Day Eight's Giveaway by 8am MST on 12/14/09! Today is DAY SIX of my Twelve Days of Blog Candy Giveaways. Leave a comment with your first and last name, and email address, to enter. Make sure you check out the Rules in THIS POST before leaving your comment, to ensure your entry qualifies. Today's Giveaway includes some 6"x6" swatches of Ski Slope Designer Series Paper, the Flaky Friends stamp set, and a spool of Rope Twine. Be sure you enter this giveaway in accordance with the RULES, or your entry will be discarded. You must enter by 6am MST on 12/13/2009, to be in the drawing for the Day Six Giveaway! Day Seven's Giveaway should be posted, along with Day Six's winner, by 8am MST on 12/13/2009. UPDATE: This post is closed, look for the winner in the December 13th post--which has been delayed until 10am MST. Today is DAY FIVE of my Twelve Days of Blog Candy Giveaways. Leave a comment with your first and last name, and email address, to enter. Make sure you check out the Rules in THIS POST before leaving your comment, to ensure your entry qualifies. Today's Giveaway is a package of Dashing Designer Series Paper, the Holiday Happiness stamp set, and the coordinating Stampin' Around Swirling Stars jumbo wheel. The photo below shows the rubber on the back of the stamps. I thought this was a fabulous set, but it was only available for a short period of time, so it really needs more love! 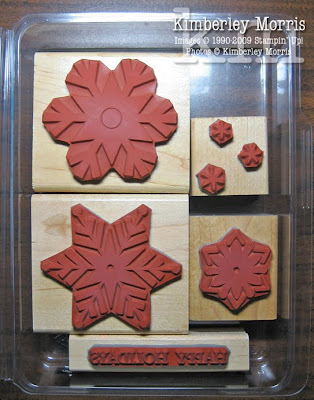 To use the Stampin' Around wheel, you'll need a Jumbo Stampin' Around Handle (103661, $5.95). The Dashing paper package contains 12 double-sided 12"x12" sheets and coordinates with the following colors: Old Olive, Real Red, Very Vanilla, and Sahara Sand, which are currently available in card stock, ink, and various ribbon and embellishment product. Be sure you enter this giveaway in accordance with the RULES, or your entry will be discarded. You must enter by 6am MST on 12/12/2009, to be in the drawing for the Day Five Giveaway! Day Six's Giveaway should be posted, along with Day Five's winner, by 8am MST on 12/12/2009. UPDATE: This Giveaway is closed--look for Day Five's Winner, and Day Six's Giveaway at 8am MST. Today is DAY FOUR of my Twelve Days of Blog Candy Giveaways. Leave a comment with your first and last name, and email address, to enter. Make sure you check out the Rules in THIS POST before leaving your comment, to ensure your entry qualifies. The photo below shows the rubber on the back of the stamps. 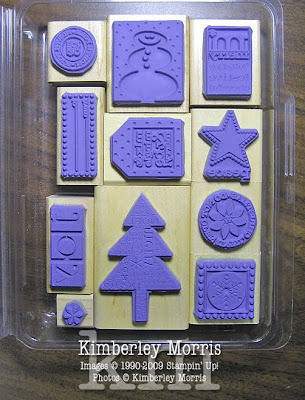 It is a lavendar color because this stamp set was only available as a Hostess exclusive! To use the Stampin' Around wheel, you'll need a Stampin' Around Handle (102971, $3.95). The images in this stamp set work wonderfully with punches: the picture at the center of each image can be punched out with the 1" Circle Punch (109046, $10.95), the 1-1/4" Circle Punch (104403, $15.95) pops out the image + words perfectly, and that can be layered onto a 1-3/8" Circle Punch (104401, $15.95), which can then layer onto the Scallop Circle Punch (109043, $15.95)! Be sure you enter this giveaway in accordance with the RULES, or your entry will be discarded. You must enter by 6am MST on 12/11/2009, to be in the drawing for the Day Four Giveaway! Day Five's Giveaway should be posted, along with Day Four's winner, by 8am MST on 12/11/2009. UPDATE: This Giveaway is now closed, please check again after 8am on 12/11/09 for Day Five's Giveaway. Today is DAY THREE of my Twelve Days of Blog Candy Giveaways. Leave a comment with your first and last name, and email address, to enter. Make sure you check out the Rules in THIS POST before leaving your comment, to ensure your entry qualifies. Today's Giveaway is a snowflake lover's dream come true! 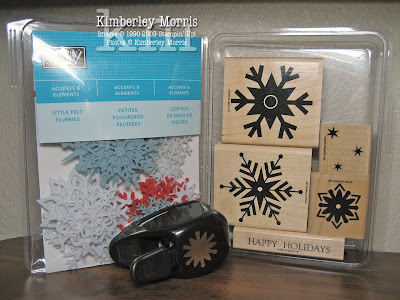 The Winner will receive the Snowfall stamp set, Snowflower Punch (yes, it's the same size & shape as the image in the stamp set), and a package of Accents & Elements Little Felt Flurries. To attach the Little Felt Flurries to a project, you'll probably want some Tombow Multipurpose Adhesive (110755, $3.95). The Snowflower Punch looks extra cute if you punch through each of those round ball ends with the 1/16" Circle Punch (101227, $8.95). Dazzling Diamonds Glitter (102023, $4.50), applied with the 2-Way Glue Pen (100425, $3.50) makes any snowflake or snowy scene glisten like the real thing! Be sure you enter this giveaway in accordance with the RULES, or your entry will be discarded. You must enter by 6am MST on 12/10/2009, to be in the drawing for the Day Three Giveaway! Day Four's Giveaway should be posted, along with Day Three's winner, by 8am MST on 12/10/2009. UPDATE: This Giveaway is now closed, look for the winner and Day Four's Giveaway by 8am MST 12/10/09. Today is DAY TWO of my Twelve Days of Blog Candy Giveaways. To see the rules, check out THIS POST. 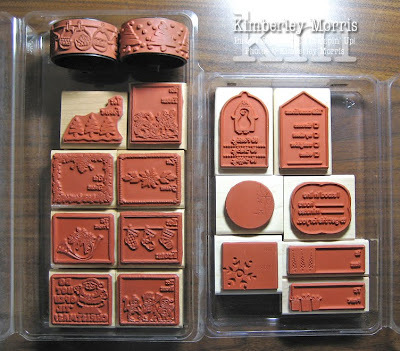 Below is a shot of the rubber sides of the stamp sets. 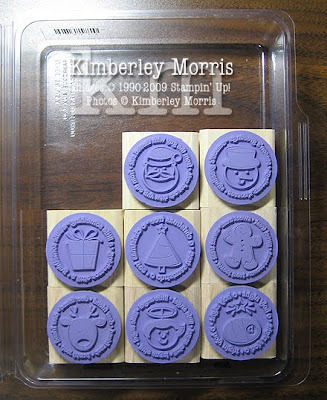 Again, I keep my stamps very clean--one of these sets is over 10 years old and you can't even tell. To use the Stampin' Around wheels, you'll want a Stampin' Around Handle (102971, $3.95). You can ink up the wheel by rolling over an ink pad, but if you'd like the image to be continually inked, you'll need a Stampin' Around Standard Cartridge. Using a continuously inking cartridge allows you to roll images over unlimited media sizes--such as tissue paper, wrapping paper, or butcher paper. 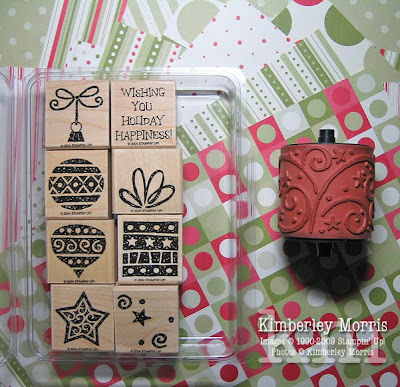 These ink cartridges are available in 15 Stampin' Up! exclusive colors, and Basic Black. (see pages 155-157 of the 2009-2010 Idea Book & Catalog) If you choose a coordinating color ink pad from the same pages for stamping your tags, your gift-giving presentation is complete. You can order these supplies through my ONLINE STORE anytime! Be sure you enter in accordance with the RULES, or your entry will be discarded. You must enter by 6am MST on 12/9/2009, to be in the drawing for the Day Two Giveaway! Day Three's Giveaway should be posted, along with Day Two's winner, by 8am MST on 12/9/2009. UPDATE: This Giveaway is closed, look for the Winner, and Day Three's Giveaway in a new post by 8am MST today, 12/9/09. 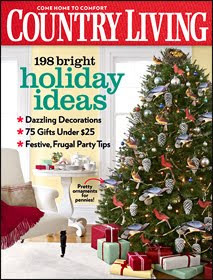 Would you like to subscribe to Country Living magazine? The cover price is $3.99 per issue, but you can get 10 issues for only $10! Just click THIS LINK, fill in your subscription info, enter your payment, and you're good to go. For just $1 per issue, you'll receive great craft project ideas, articles on collecting, makeover features, recipes, and entertaining ideas! 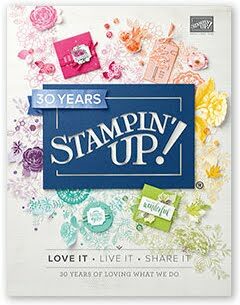 You don't have to be a stamper, or a Stampin' Up! customer to get this deal, so feel free to email the link for the offer to all your friends. *I am speaking hypothetically and cannot make any delivery estimates or guarantees. Please contact Country Living magazine's Customer Service with your delivery concerns. Today is the first day of my Twelve Days of Blog Candy Giveaways. To see the rules, check out THIS POST. 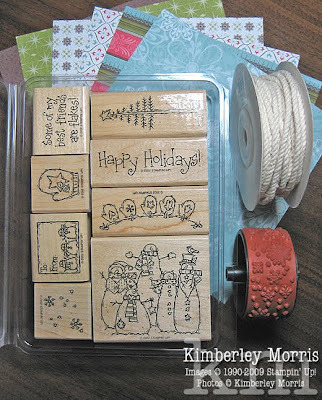 Today's Giveaway is sure to give you a jump start on your holiday card making. 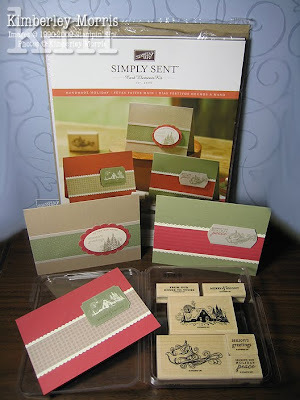 It includes a Handmade Holiday Simply Sent Card Elements Kit, and the coordinating To You & Yours stamp set! Here is a shot of the other side of the stamp set--as you can see, it's in pristine condition. The kit makes 18 cards total (6 each in 3 styles), and one of each of the three of the cards has already been completed for you. The kit includes card stock, patterned paper, self-adhesive die cuts, and full instructions. I am also tossing in 20 Very Vanilla Envelopes, so your cards will be ready to mail! 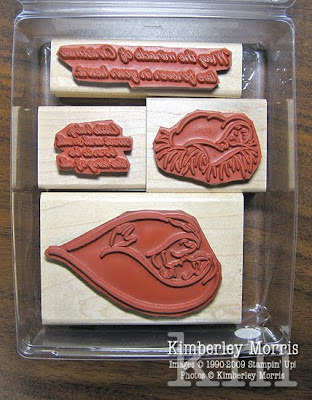 All you need to make the remaining 15 cards, in addition to the stamp set I am including, is: a Close to Cocoa Stampin' Write Marker (100072, $3.25), a Mellow Moss Stampin' Write Marker (100038, $3.25), and a Ruby Red Stampin' Write Marker (100075, $3.25). Of course, you'll want a precision cutter and some adhesive--I recommend the Paper Cutter (104152, $24.95) and SNAIL Adhesive (104332, $6.95). You can order these through my ONLINE STORE anytime! Be sure you enter in accordance with the RULES, by 6am MST on 12/8/2009, to be in the drawing for the Day One Giveaway! Day Two's Giveaway should be posted, along with Day One's winner, by 8am MST on 12/8/2009. 12/8 6:00am: This Giveaway is now CLOSED, look for the Day Two Post to see who won and to enter the next Giveaway! TWELVE DAYS OF CMAS BLOG CANDY! In honor of the Ellen DeGeneres Show's 12 Days of Giveaways, I am going to host my very own Twelve Days of Blog Candy Giveaways! 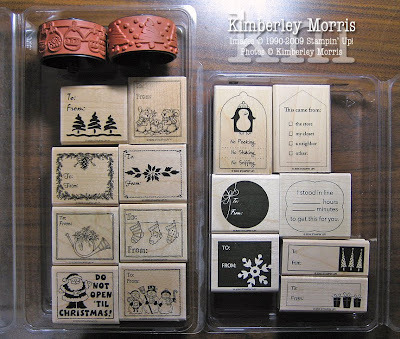 Giveaway stamp sets include: Snow Angels, Flaky Friends, Snowfall, Christmas Gift Tags, Holiday Basics, Holiday Happenings, Miracle of Christmas, and more! 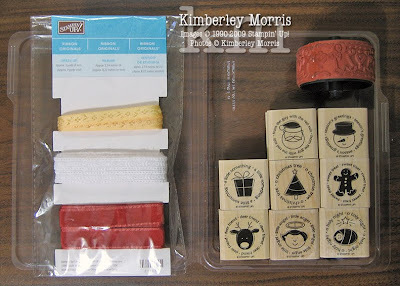 I'm also giving away discontinued patterned paper, ribbons, and other accessories and embellishments with each stamp set. DISCLAIMERS: One winner per name, delivery address, and/or email address during the 12 days, please. No purchase necessary to enter, however, each separate purchase from my ONLINE STORE will give you 10 entries that will remain in the pool from the time I receive notice of your purchase, until the end of the giveaways. Winners will be chosen randomly and will be emailed the morning after the giveaway was posted, and MUST claim their prize by providing a valid postal address for delivery within 24 hours. (If you want to give the prize as a gift, by having me mail it directly to a third party, be sure to let me know so I can wrap and label it appropriately!) Prizes will be delivered via Priority Mail to U.S. addresses only, and may require the addressee's signature on delivery--so you need to give me the correct information to ensure your prize can be claimed. You must know the laws of your own state, and it is your responsibility not to enter if this giveaway is prohibited by your state law. You may not have noticed, but the 2009-2010 Idea Book & Catalog was missing a few stamp sets! They were available for order, but not shown in the catalog. They were on what's known as the Dormant List. Some stamps sets have been on there for a year now, and they will be retiring. 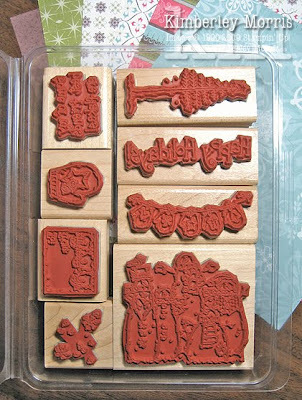 In fact, all but one stamp set (Easter Beauty) will be discontinued after January 4, 2010. Click HERE to see a list of Retiring Dormant Stamp Sets, with images and prices. The best way to ensure your order is placed on time, is to make your purchase through my ONLINE STORE. You are always welcome to email me at any time, or call me at 719-205-5957, with your order. Especially if you are ordering for the first time, I'd love to assist you in your decision-making and shopping process.